Today we listened to sounds. When we closed our eyes and listened really hard we could hear a lot of sounds in the classroom we don't usually notice. Some of these were the fans, footsteps on the balcony, squeaking chairs and breathing. Then we went outside and listened there. The outside noises were louder than the inside noises. We heard lots of sounds outside, some of them were balls bouncing, laughter, whistles blowing, crows and water splashing from the bubblers. 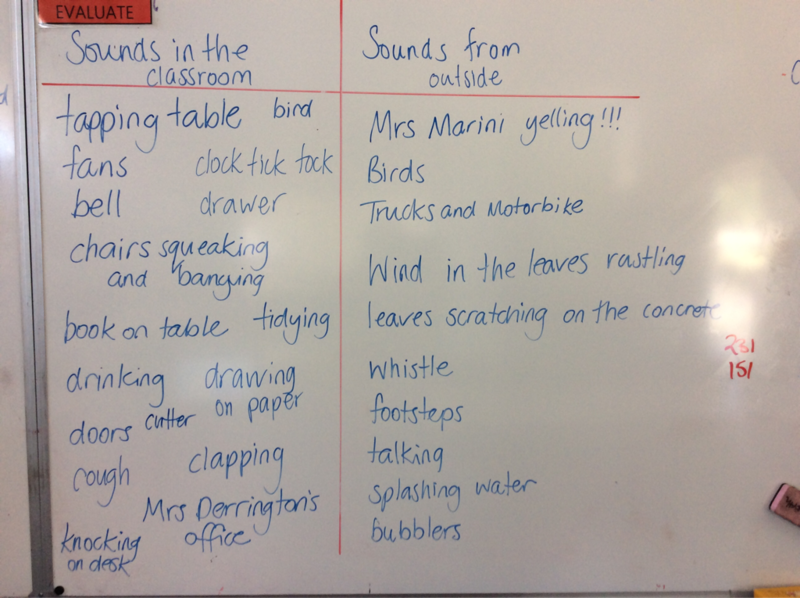 We were given a small piece of coloured paper and were asked to choose one of the sounds that we heard inside or outside to draw and annotate. We described the sound and said if it was a loud sound or a quiet sound. Next week we are going to finish our pictures use them for an activity. This week we will begin recording our what we see in a table. We use tables a lot in science to collect information. We use an annotated drawing to show an idea or object.